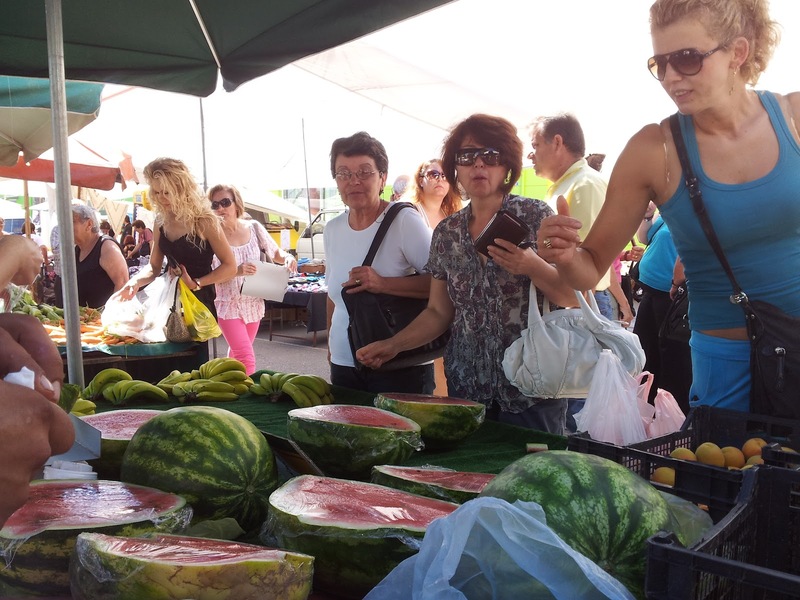 Today is Tuesday, the open market “laiki” is in town. The market is predominantly a vegetable market it has been around in one form or another for many, many years. It was set up so that the local farmers could have a place to exchange their produce. One man would have tomatoes, he would trade these for potatoes etc. the meeting place was called “agora”. It started in the ancient days. You could, I imagine, go as far as saying the Greeks have been going to these markets for the last 4000 years. Over time and as civilisation has progressed the market has gone from a place where you trade for other produce to a place where produce is exchanged for money. Today the open market covers, amongst other things, everything from fruit and vegetables, fish and cheese to clothes and fabrics. 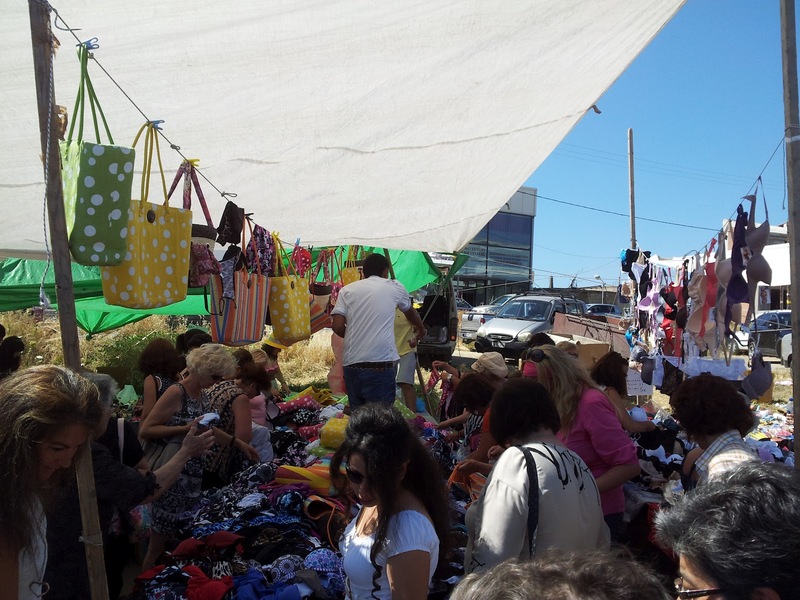 The market comes to Sitia once a week. Most towns and villages have a market once a week and some of the larger cities have permanent markets. I always find the market interesting and between my husband and I we normally make it to the market every week. I like to go to see what’s in season and to have a slow wander around – it’s more of an inspection, once I know what everyone is selling I start my shopping. My husband on the other hand likes to get the job done, he is in and out of the market like a whirlwind, a fluster of brightly coloured plastic bags filled to the brim with equally as brightly coloured fruit and vegetables. Before we moved to Crete we were fierce carnivores, we ate meat with just about every meal, however we lived in the middle east where good quality meat was reasonably inexpensive. Crete on the other hand, well let’s just say that the meat is much more expensive, the quality of the meat which we really liked to eat – beef steaks- are nowhere near as good. Crete doesn’t import beef to the supermarkets and I haven’t seen a cow on the island since I moved here, probably something to do with the lack of flat fields and the monstrous mountains that run down the centre of the island. So, inevitably, we have almost cut red meat out of our diets. We may eat chicken or pork once of twice a week, a fact which I am sure our bodies thank us for. In place of meat we have vegetables which is the reason for our weekly pilgrimage to the market. The Market as I said interests me, the produce are nearly almost all locally grown, I won’t go as far as saying that they are organic but they certainly come from the local area. Most local Greeks have a plot of land somewhere on the island which they cultivate. There is fierce competition between farmers over who grows the best, yet at the same time there is a massive sense of community in the area. I regularly get given a bag of apples, a sackful of oranges, vegetables often arrive at the office door unannounced and on some days I get home to discover my dogs playing with a watermelon that has been left at the door, a slobber covered hand written note lying on the mat. 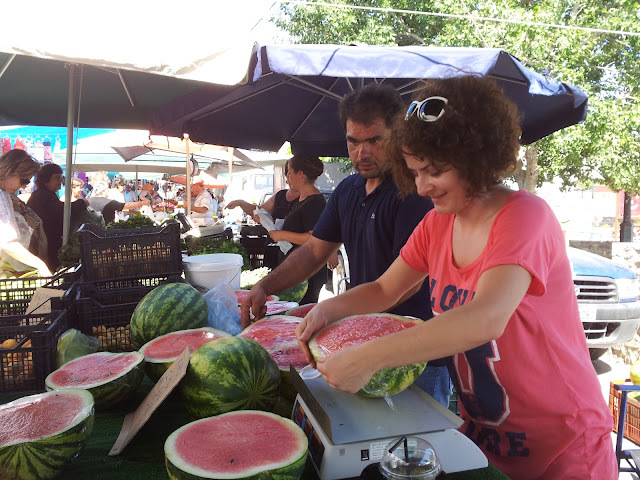 Back to the market, when I first arrived in Crete my husband’s aunt took me on her weekly trip to the market, her English was minimal but so was my Greek. It was a fascinating experience - we managed to get through the day, me talking English her speaking Greek don’t ask me how but we seemed to understand each other. Once we got there almost every person in the market said hello to her and so a job that should have taken twenty minutes took the best part of an hour. It made me laugh as we struggled back to her car laden with just about every kind of fruit and vegetable that grew on the island I thought to my self “well living here could be interesting”. Over the last year and a half I have noticed a change in the market while the vast amount of fruits and vegetables still disappear from the stalls early, more and more people are buying their clothes from the market. When I first got to the Island I would look at the clothes side of the market, which runs parallel to the vegetable side and wonder who was buying them. Very rarely would there be more than two of three people at a stall. Yet over time the quality started to improve and somehow the prices stayed the same. A winning recipe in Greece at the moment. Today was the first day for a while that I could hardly move in the market - so much so that I abandoned my normal shop and started taking photographs (with my phone – the big camera was tucked up at home). 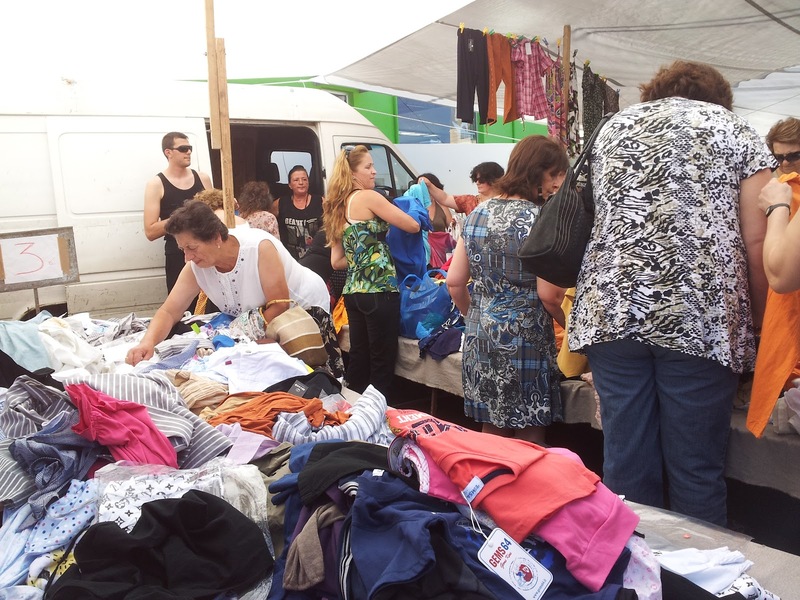 I was surprised at the number of people who were buying clothes from the stalls. And it wasn’t just one or two stalls it was almost all of them. It led me to think, yes money is tight with the Greeks at the moment and while a lot of big stores are suffering the people are still finding a way to get what they want. They are simply sourcing it from different places and while this is not exactly helpful to the big corporations the small trades people are doing quite well for themselves. Which in turn led me to think that perhaps there is a way out for Greece – it’s just not through the big boys but through the small businesses which have identified a niche in the market too small for the major companies to get involved in but too big to not be filled at all. Perhaps with enough businesses thinking carefully Greece will ever so slowly clamber out of the mess in which it finds itself.